Bush said the U.N. Security Council will vote in a matter of days on a U.S.-backed resolution authorizing force against Iraq. After chief U.N. weapons inspectors report to the Security Council Friday, International Atomic Energy Agency chief Mohamed ElBaradei will appear on 'Lou Dobbs Moneyline' at 6 p.m. EST. Washington: President Bush said diplomatic efforts to disarm Iraq are entering "last phase." Beijing: China joins coalition of unwilling, siding with France, Russia, Germany against U.S.-sponsored second resolution. Washington: Gen. Tommy Franks tells Bush administration that U.S. military is ready for action. Baghdad: Diplomatic sources tell CNN that Russian workers have joined a growing exodus from Iraq. WASHINGTON (CNN) -- President Bush accused Iraq of engaging in a "willful charade" with U.N. weapons inspectors by hiding weapons of mass destruction and said that if the world fails to confront that threat, free nations would face "unacceptable risks." "I believe (Iraqi President) Saddam Hussein is a threat to the American people. I believe he's a threat to the neighborhood in which he lives," Bush said, listing how the Iraqi regime has invaded neighboring countries and poisoned its own people. "As we head into the 21st century, when it comes to our security, we really don't need anybody's permission." In his prime-time news conference Thursday, Bush said disarming Iraq is the world's problem because Saddam provides funding and safe haven for terrorists. "The attacks of September the 11th, 2001, show what the enemies of America did with four airplanes. 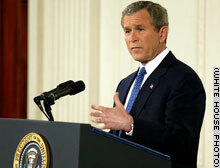 We will not wait to see what terrorists or terrorist states could do with weapons of mass destruction," Bush said. When asked about giving Saddam an ultimatum -- a two- or three-day deadline to disarm, Bush said: "We're still in the final stages of diplomacy." The president noted that chief U.N. weapons inspector Hans Blix would report Friday to the Security Council on Iraqi disarmament efforts. "The world needs him to answer a single question: Has the Iraqi regime fully and unconditionally disarmed as required by Resolution 1441? Or has it not?" Bush said. He also said that although he had not yet decided whether to invade Iraq, U.N. Security Council members would decide in a matter of days whether they would join the United States in forcibly disarming Iraq. "We're calling for the vote," Bush said. "It's time for people to show their cards, let the world know where they stand when it comes to Saddam." As Bush was speaking, U.S. Secretary of State Colin Powell met with French Foreign Minister Dominique de Villepin and later sat down with German Foreign Minister Joschka Fischer. Both France and Germany are opposed to a second U.N. resolution that could bring military action against Baghdad. A French official told CNN that France would not be adverse to a "close of rendezvous," or a proposal saying weapons inspectors could give Iraq key disarmament tasks to accomplish in a certain time period. The official did not want to use the word "deadline" or "ultimatum" but said that Baghdad could be given a reasonable time frame in which to finish the key tasks, and then the U.N. Security Council would judge whether Iraq has complied. France would not, the French official said, allow the proposal -- which would not be a resolution, he said -- to include an ultimatum allowing the use of force. Blix has previously indicated the inspectors should be allowed to work in Iraq for at least four months, but France has suggested it would be willing to accept a shorter time frame. In the face of clear signals from veto-wielding France, China and Russia that they would oppose it, British and U.S. officials said Thursday they would be willing to amend the resolution in the hopes of overcoming opposition. On Friday, Blix and International Atomic Energy Agency chief Mohamed ElBaradei will update the council on inspections in Iraq and the extent of Baghdad's cooperation. Blix is expected to present a list of outstanding questions for Iraq to answer. Afterward, debate on the new resolution is expected to begin. At least 11 foreign ministers and one deputy foreign minister plan to attend, a U.N. spokesman said Thursday. The Bush administration is involved in "serious discussions" about amending the resolution to include a final deadline for Iraq to disarm, a U.S. official familiar with the talks said. The U.S. official in Washington said the one thing the White House has made clear is "the negotiations themselves cannot become a source of delay and delay. We need this settled soon." The announcement came amid a flurry of diplomatic meetings involving Powell, British Foreign Minister Jack Straw and Spanish Foreign Minister Ana Palacios. U.S. and British officials said they believe the resolution may get the necessary votes and avoid a veto. For the resolution to pass, nine votes are needed. Only four appear guaranteed: the United States, Britain, Spain and Bulgaria. Permanent Security Council members France, Russia and China could veto the proposal. With Germany and Syria siding with those opposed to the resolution, much attention is being focused on the remaining six council members: Guinea, Cameroon, Angola, Mexico, Chile and Pakistan. All non-permanent members, they're being called the "undecided 6" or "U-6" in U.N. circles. Pakistani U.N. Ambassador Akram Munir said Thursday the non-permanent members have been talking about trying to work out a compromise, but "we're losing hope" of reaching a peaceful solution. Speaking to a Senate subcommittee before heading to New York, Powell repeated the U.S. contention that the United Nations risks becoming "irrelevant if it passes resolution after resolution that is simply totally ignored by a country in a situation where that country continues to develop weapons of mass destruction." "The moment we find ourselves in now is a critical moment where we are being tested and where the Security Council of the United Nations and the international community is being tested," said Powell. Russian U.N. Ambassador Sergey Lavrov reiterated his country's position that inspections are working and should continue. He would not see a plan to postpone military action as a compromise, he said. "Where's the compromise in that?" Only the inspectors can establish specific deadlines, Lavrov added. China on Thursday said a new resolution is "absolutely unnecessary," sharing a position taken a day earlier by France, Russia and Germany. "The Iraq issue is now at critical juncture of whether there will be a military solution or a political one," Chinese Foreign Minister Tang Jiaxuan said. "We hope for a political solution within the framework of the U.N. Security Council." They also said in a joint statement that U.N. inspections in Iraq cannot go on indefinitely. CNN Correspondents John King, Andrea Koppel and Nic Robertson and U.N. Producer Ronni Berke contributed to this report. For latest developments, see CNN.com's Iraq Tracker.